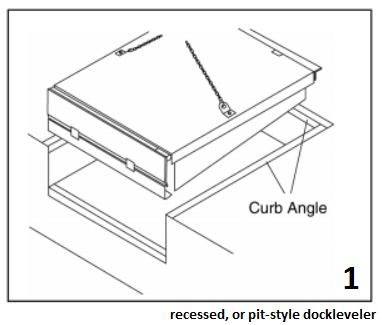 The recessed, or pit-style (1), dock leveler is the most common type of dock leveler because it has a greater operating range, load range, and life expectancy. Dock levelers are most often installed into pits that are formed into the concrete ahead of time. The pits are sized to meet the exact requirements of the dock levelers being used.